(Photo: LWF / Michael Hyden)A boy who gets schooling under a Lutheran World Federation education project for Yida refugees, South Sudan in 2013. 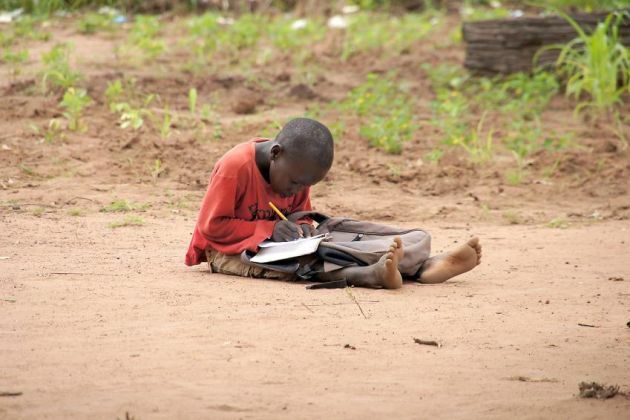 GENEVA, Switzerland - The Lutheran World Federation has received a grant of 600,000 euros (US$815,000) from the European Union to undertake education for war-affected children in South Sudan, the world's newest country and also one of the poorest on the planet. During an award ceremony in Brussels on November 20, the LWF signed a contract with the European Union for the funding that is dedicated from the 2012 Nobel Peace Prize money. "The EU Children of Peace initiative supports a key area of humanitarian and development aid: education for children affected by conflict - so that 'children of war' become 'children of peace,'" said José Manuel Barroso, President of the European Commission at the signing. "We are grateful for the opportunity offered through this project," said Rudelmar Bueno de Faria, who is humanitarian director for LWF's Department for World Service, during the "EU Children of Peace" award ceremony. "The LWF has extensive experience providing education and child support in conflict zones. Through this project we will be reaching over 5,000 children and offer them hope for a sustainable and peaceful future." Bueno de Faria told Ecumenical News some of the other aid groups that received some of the EU prize money were Save the Children and the Norwegian Refugee Council. South Sudan became an independent state on July 9, 2011, following a referendum passed with 98.83 per cent of the vote and after many decades of civil war with its northern neighbour, Sudan. South Sudan has also experienced internal conflict since its independence. In 2012 the EU received the Nobel Peace Prize that came with an award of 930,000 euros. The EU decided to top up the prize money to 2 million euros and use the money to fund humanitarian projects providing education to conflict-affected children in Africa, Latin America and Asia. The EU hopes to advocate for more support towards education projects in the future through the EU Children of Peace project. The LWF's director of its world services division, Rev. Eberhard Hitzler, underlined the significance of the EU funding in creating a peaceful environment for children. "Some years back I visited a school in Nimule, a small border town in South Sudan near Uganda. Over 500 children were learning and playing in the compound," he said. "It all looked very peaceful until the children shouted 'Antonov' [the name of a Russian war aircraft].' Only seconds later, the first of 12 splinter bombs were dropped on the village. "I will never forget the terror in the eyes of the children, who were running in all directions seeking cover. The reality that these war-affected children are facing made a strong impression on me," Hitzler added. He noted that the LWF has worked with education and support for children in some of the world's most precarious conflict zones for many years. "We are grateful for the opportunity offered through the EU project, and we are deeply committed to assisting children in South Sudan become children of peace through this project," Hitzler explained. The LWF is among nine organizations chosen under the EU Children of Peace initiative. The 18-month project will start on December 1 and activities will be focused on refugee camps in South Sudan's Upper Nile and Unity states. These camps are hosting around 200,000 people who have fled violence in South Kordofan and Blue Nile states in neighboring Sudan. A majority of the population in Upper Nile and Unity states are school-age refugee children who are particularly vulnerable and susceptible to violence at community level and to being recruited as child soldiers. The LWF has been working in South Sudan for several years. The funds from the EU Children of Peace will be used to accelerate learning programs and ensure safe school environments, an area which is acutely underfunded. The LWF also works with the United Nations in administering the world's biggest refugee camp in Dadaab, north eastern Kenya some 100 kilometers (60 miles) from the Somali border near another conflict zone.